The last Blogging for ME/CFS Awareness was May 2010. Use your voice online to raise awareness. 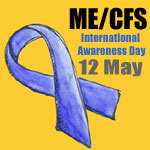 May is the month for ME/CFS Awareness. We compiled a list of blogs for ME/CFS Awareness during the month of May each year 2008-2010. Joining many online voices together to raise awareness of ME/CFS. None of these names captures the diverse symptoms that people who suffer from this complex disorder experience. Yes, people with ME/CFS experience fatigue, but they are also prone to memory loss, cognitive functioning problems, sleep disturbances, headaches, depression, muscle and joint pains, low-grade fever and a multitude of other symptoms. Even the word fatigue does not accurately capture the debilitating nature of the exhaustion these people experience. Their fatigue is severe enough to significantly limit their ability to work, go to school, participate in social activities and take care of their personal needs – and is not relieved by bed rest or sleep. ME Association – What is ME/CFS? The naming and defining of ME/CFS is fraught with difficulty. All persons diagnosed with ME or CFS or any of the conditions listed below all need better understanding, care and research. We didn’t choose the name for this campaign but for the purposes of raising awareness to a wider audience we feel the name is less important than getting the message across. Working together to raise awareness. This blog was started by RachelCreative, a blogger with ME, after hosting a Blogging For ME/CFS Awareness event on her own blog in 2008. As a sufferer of ME herself she felt frustrated at not being able to do very much for ME Awareness Day/Month or being able to find an official web site with badges and banners. A frustration which was shared by online friends. So she encouraged them to blog for awareness and provided some badges for their web sites. She collated all those individual bloggers in a list and this showed they were not in this alone. Many more people also used the badges (on their Facebook, MySpace and so on) even if they couldn’t blog. The ME Aware blog was started as a central place to list the blogging and online efforts of individuals in raising awareness of ME/CFS for 2009. During 2009 many more awareness campaigns began through Twitter, Facebook and web sites so in 2010 the primary focus became once again encouraging individuals to blog for ME/CFS Awareness during the month of May and to provide a central list of these posts. Following the success of other groups in rallying support for ME/CFS and FM Awareness this blog was closed in January 2011 encouraging people to support the now flourishing awareness groups.